Hakol Chai volunteer Avi Saad arranged to have these badly injured animals taken from their owners. 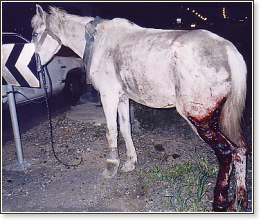 This was the third injured horse in three months from the same area near Kfar Saba. 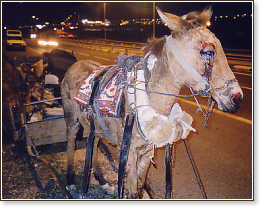 Horses, some in terrible condition, with old, never-treated injuries, had been made to haul heavy iron scraps long distances in the hot sun, without water, from Palestinian areas to an Israeli recycling center that exchanges the iron for cash. Sometimes, as in the case of this horse, they are hit by cars. 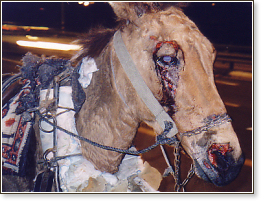 Hakol Chai notified government officials of the incident, which once again pointed up the widespread problem of horse abuse in Israel and the urgent need for our campaign calling for minimum standards of horse and donkey care, mandatory annual licensing and inspection, and a ban on horses on city streets and highways.